If you want to get a better sound, using the best ukulele strings is one way to make a huge difference. You might think that all ukulele strings are the same. We did, too, until we got into our research. Whether you’re set on phd ukulele strings because you think they’re the best or you want to discover something new, our ukulele strings review is here to help. First, let’s look at some of the things you need to know about before shopping. Pieces: Most of our picks come in sets of 4, which is good since that’s how many strings a ukulele has. We also found some multi-packs that give you 2 or even 3 different sets that you can use for a while. Type: There are different kinds of ukuleles just like there are different kinds of just about any instrument. So, we looked for strings of all types. We found great options for soprano, tenor, baritone, and even concert ukes. Tuning: Ukulele tuning depends on the kind of uke you have (whether it’s a soprano, tenor, bass, etc) and the sound you want. 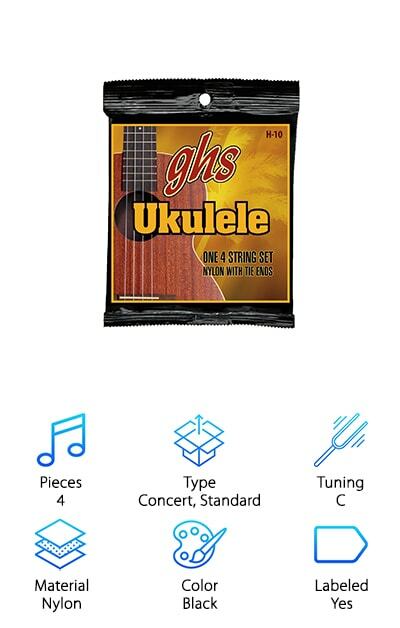 We found strings for High G, which is the most popular, plus C and Low G.
Material: There are a few different materials that are used for ukulele strings. None of them come from the same natural sources as the first ukulele strings did, but we think nylon, fluorocarbon, and monofilaments all do a pretty good job. Color: When it comes to the range of ukulele strings, there are a surprising amount of color options. We found some that are white, clear, black, and that cool purple color that clear monofilament gets in certain light. Labeled: To make it easier, most of these strings come labeled. Some are numbered, some are color coded. Either way, it’s nice to have a little help so you can quickly get your strings on in the right order. Now that we’ve gone over our ukulele strings buying guide let’s get into our top 10 reviews. If you’re in a hurry, check out our top and budget picks. They’re right at the top of the list and a really great place to start to get a good idea of what’s available out there. Keep reading if you can, all 10 of these products are great. So, what are the best ukulele strings? Let’s find out. 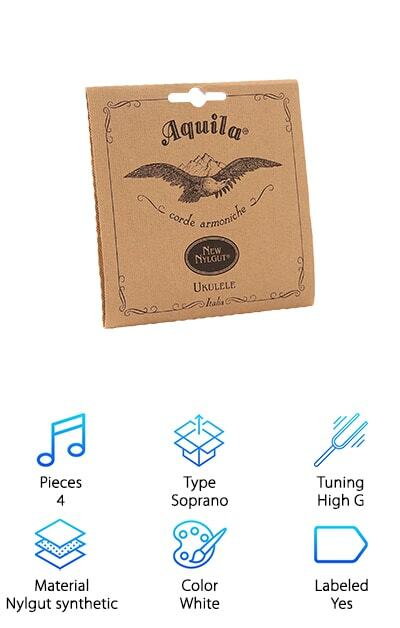 Our top pick is the Aquila AQ-4 Ukulele Strings which also happen to be the best soprano ukulele strings we came across in our research. These were designed to have a sweet sound and also feel nice when they’re being played. They’re made out of a proprietary composite material that doesn’t absorb as much moisture as natural strings do. Why exactly does that matter? It helps achieve more accurate tuning. One thing we liked about these strings is that they sound less tinny than some other synthetic strings do. You really do get a better sounds. That’s not all, these strings were handcrafted in Italy and come to you as a complete set of 4. One more thing: technically, they’re not our budget pick but they’re also a really good choice for the money. Now, if you’re looking for the best tenor ukulele strings, here they are and also happen to also be our budget pick. 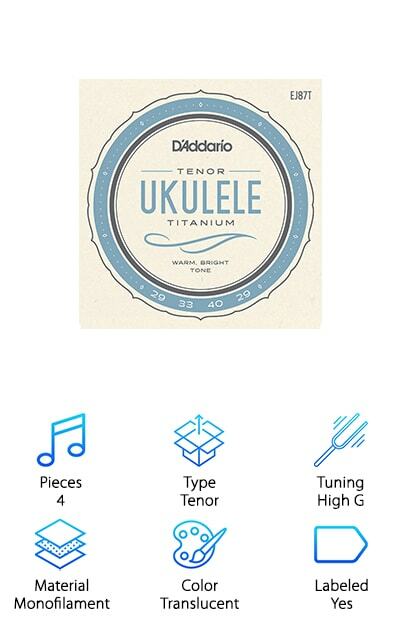 D’Addario EJ87T Titanium Strings are made of titanium monofilament that makes for a really great sound. It adds a hint of brightness and helps project the notes which help make your performance even better. These strings are translucent by they have that purplish tint to them that translucent things often do. We’re not complaining, we actually think it looks pretty cool. They feel really nice, too, the nylon is super smooth and a piece of cake to play. These strings come in a set of 4 and made right here in the USA. To make stringing your ukulele easier, they’re labeled and color coded so you can easily tell which string goes where. 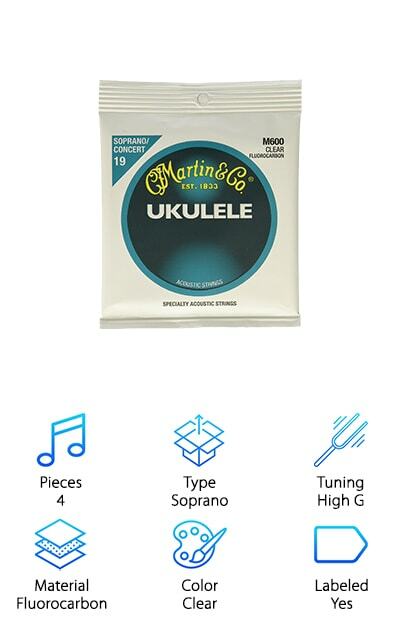 A really good choice if you’re looking for fluorocarbon ukulele strings are these Martin M600 Ukulele Strings. One of the reasons that fluorocarbon is so good is because it’s dense. In fact, it’s a lot denser than nylon which gives is a richer, more rounded sound. Fluorocarbon doesn’t stretch as much, either, which means it that it holds onto its tuning better. What does that mean for you? You can play more without having to tune as frequently. Martin & Co. manufacturers their string themselves and use high quality materials, precision, and care to produce strings that perform well. They thought of everything, right down to the recyclable packing materials that prevent the strings from being tarnished in transport. They’re also been making ukuleles for a long time. These are the same strings that come standard on their own models. One of the things we liked most about the Mudder Soprano Ukulele Strings is the color. They’re bright white which means they’re really easy to see against the fretboard. 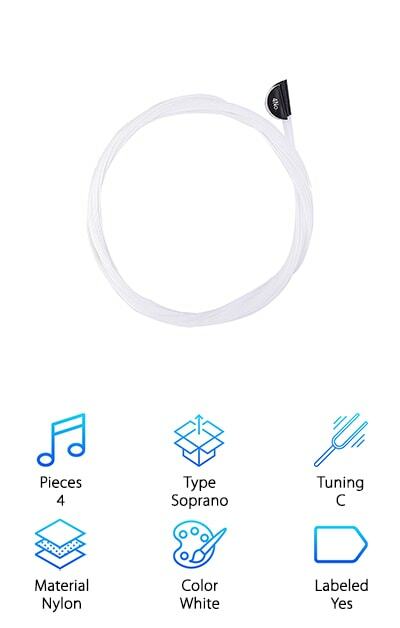 If you have trouble seeing the clear strings or if you just want to change it up a bit, give these white strings a go. Something really great about this set is that each set comes with Mudder’s exclusive nylon trebles. What does that mean for you? Your uke will have better intonation and project a welcoming, warm sound. This is a set of 4 strings that are labeled so there’s no guessing about what order to string them in. They’re made of nylon and give off a really bright, cheerful sound. They’re generally really easy to work with and fun to play. And get this: the price is really affordable. 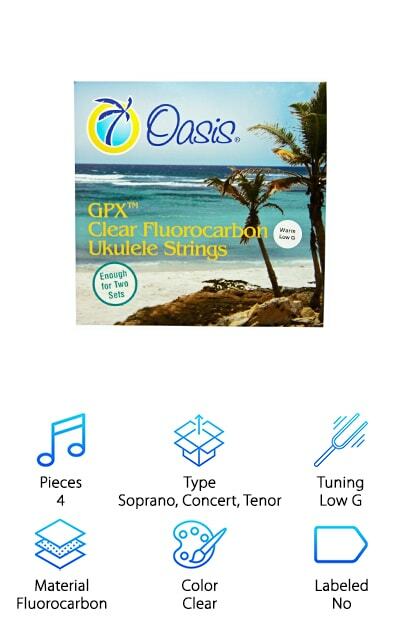 Oasis Warm Ukulele Strings are versatile enough to use with a soprano or a tenor. But they’re also some of the best concert ukulele strings around. When you take them out of the package, the first thing that you’re going to notice it that they’re long. Like, really long at around 63 inches. Get this: you cut them in half and you actually get 2 pairs of strings in this 1 package! String 2 ukes or save a set for later, it’s really up to you. Oasis have taken a lot of consideration with their sound and have developed these particular strings to have a warm sound. They actually considered information from ukulele players in an online forum to figure out their goals. We think it worked well and we think you might like it, too. These GHS H-10 Hawaiian Strings are a great pick for your concert or standard ukulele. Let’s just state the obvious first. The thing that drew us to them is the color. Black strings are rare and we were instantly drawn to them. They really add a bit of flair to your uke when you’re used to using white or clear strings. There’s a lot more to these strings than just looking cool. For starters, they’re made of nylon and have a deep, warm sound. We really liked that they sounded like what you think of when you think a traditional Hawaiian ukulele should like. That’s not all, they also have a really nice touch. They’re smooth and easy to play. As far as getting them strung, they come labeled so it’s really easy to tell what order then strings go in. 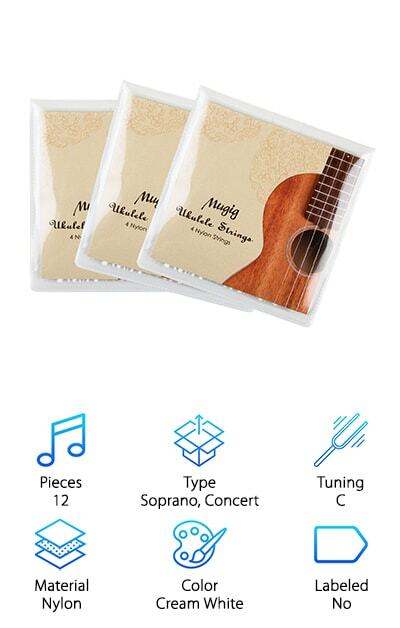 Next up on our list are these strings from Mugig. This product really gives you more bang for your buck. Why? Because you get 3 full sets of strings! That’s right, with 12 strings in all, this one will last you a long time. You can string 3 ukes at once or save the other 2 as spares. No matter what you choose to do with them, we’re pretty sure you’re going to love the comfortable and natural way these strings feel when you play them. Of course, the nylon brings more to the table than just feeling nice. They’re really durable, too. Sound is obviously important, too, and we were pleased with the sweet tone that these strings gave off. Plus, they’re cream white in color which makes it really easy to see them when you’re playing. Our choice for best baritone ukulele strings is the D’Addario EJ53B Pro-Arte Strings. Again, we were drawn to the color of these black nylon strings because they just add such a unique and interesting look to your ukulele. To be more specific, the first and second strings are black nylon. The third and fourth are actually silver-plated copper wound on nylon. These strings have great control and deliver a warm, deep tone. Baritone is below a tenor and above a bass and these strings really round on the tone. The diameters are so precise that they’re fun and easy to play. As far as stringing them onto your uke, they made it as easy for you as they can. These strings are very clearly color-coded so you’ll know how they should go. One more thing: they’re made in the USA. 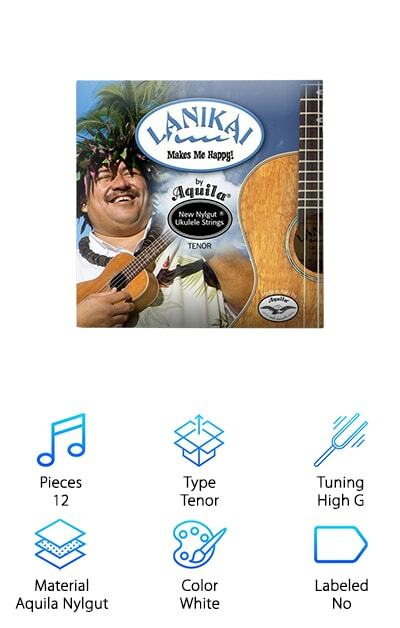 Lanikai Nylgut Ukulele Strings are next up on your list. These strings are awesome and have an interesting history. They’re actually made in Italy from a formula that was developed there. While they may seem like simple strings, these really are a high-tech product. They’re made with the utmost attention to detail and precision. The result? Each string consistently performs at a high level. The tonal quality of these strings is really good: bright and deep with a true tenor sound. They’re loud but without sounding shrill or too sharp. And that’s not all. Another thing that we really like about them is that they’re able to perform the same way with the same quality no matter what the environmental conditions. The strings themselves are soft and nice to play and they’re a nice white color that’s easy to see. 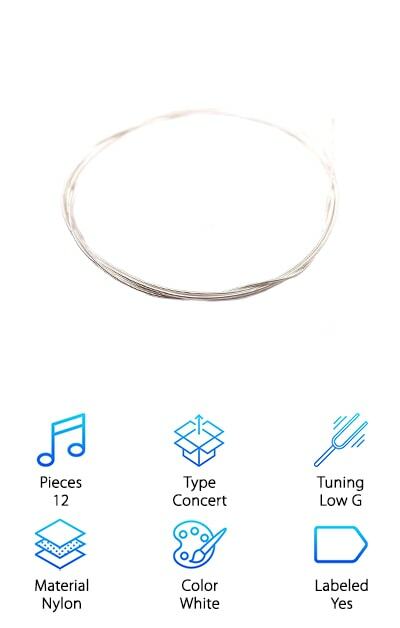 What’s interesting about these MAKA Concert Ukulele strings is that rather than using a High G, they use a Low G. While this doesn’t make them bass ukulele strings, it does add a deeper sound and makes your uke a little more rounded. What does it sound like when you play? Because you get a hint of bass, you’ll get a much fuller sound when you’re playing solo. Here’s the deal: regular Low G strings are a little floppy and don’t fit with the rest of the strings. That’s why special Low G strings were developed. In this set, you’ll receive 3 standard strings and 1 nickel-wound low G string to round out the set. This is great because it means you don’t have to run out and buy anything extra. And, nothing goes to waste.